Whoops, meant to post this last night. Ah well. Anyway, y’all have no idea how hard it was to wait to post this one. This one’s definitely one of my favorites. LOL’d. They’re getting more creative. Perhaps you can knit me a Klein bottle cap? I think this one has to be my favourite. That is….amazing. Don’t think it can be beat!! 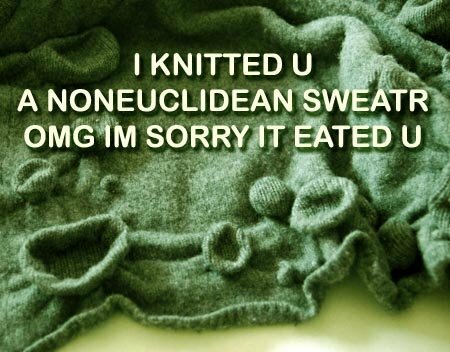 I worship..
See You Knit What.com for more non-euclidean sweateauws. I think this is teh cute. IA! IA! CUTETHULHU KNITAGN! Possibly my favourite lolthulhu EVAH!